For many users, the most expensive part of rendering a Second Life scene is rendering the avatars around you. For some time, the viewer has had a measurement [ARC or Draw Weight] of how much each avatar around you is affecting your performance; this viewer introduces some control and feedback based on that measure. A new *Avatar Maximum Complexity* control lets you prevent expensive avatars from lagging you; any avatar over the limit is displayed as a solid color rather than rendering full detail. A default limit is set based on the rendering performance of your system (we may change these defaults based on feedback with this Project Viewer). You’ll also get a notice when your own rendering complexity changes, and an indication when you’re over the limit of too many of the avatars around you. What they are talking about when they say a single color is what Whirly called Jelly Babies, a term I’ve adopted. Some have called them Gumbies. As to the ‘previously’ meaning see: Second Life: The Jelly Babies Are Coming. That is all about how we used to have to change the settings. See the opening image. I have the ‘show’ information enabled in that picture. The default is disabled. This feature can now be found in Preferences->Graphics->Advanced Settings (button) of this Project Viewer. RenderAutoMuteFunctions – Developing feature to render some avatars using simple impostors or colored silhouettes. (Set to 7 for all functionality) – 0 = off, 7=All on, values from 1 to 6 give inconsistent results. The RenderAutoMuteRenderWeightLimit setting has changed and is obsolete. The new setting for this is RenderAvatarMaxNonImpostors. The default setting is 12. This setting tells the viewer how many avatars to render before considering going to Jelly Babies. 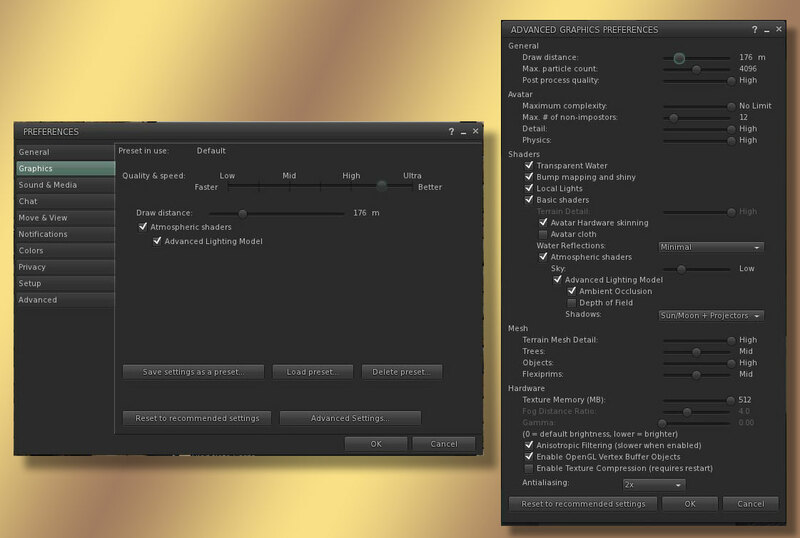 The setting is visible in Preferences-> Graphics->Advanced Settings as Max # of non-impostures. This entry was posted in Changes, Second Life, SLV2, 3, 4, 5, & 6 Series, Viewers and tagged ARC. Bookmark the permalink.